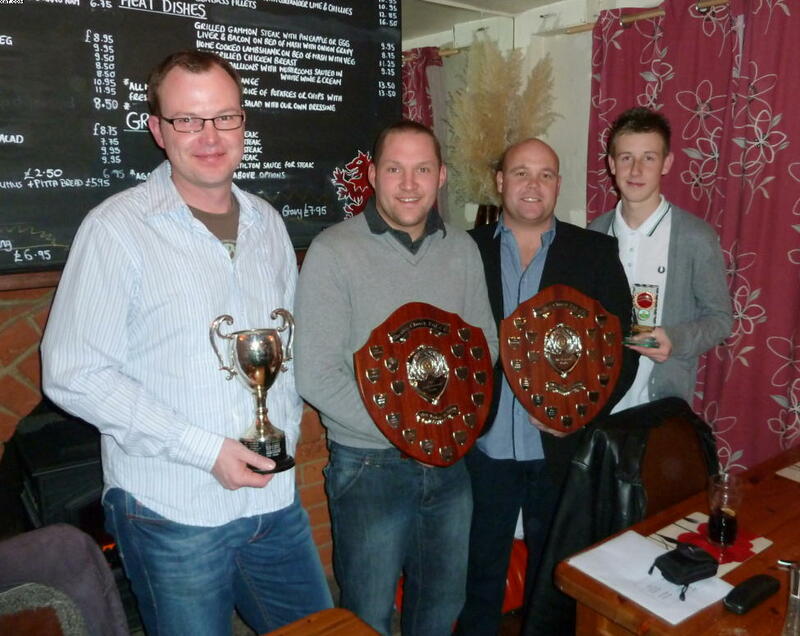 Shenley Church End CC held a very successful 2010 Presentation Evening on the back of an up and down season. As in every November, many of the club's members, wives and girlfriends turned out to celebrate another cricket campaign under their belts, held at the Old Red Lion pub in Great Brickhill on Friday 26th November. A truly brilliant evening saw over 30 members, wives, girlfriends and associates celebrate the 2010 season, despite the mixed performances. The club were also pleased to announce they raised over �0 in the club's yearly Raffle, �0 of which was raised onm the evening itself! This reflected some of the great prizes donated by members and others - many thanks to those who provided the goods. Ian Morley's generous donation of shaving/men's grooming products was a big plus, and a � voucher for the "Living Room" in MK also pushed the values up. Batting trophy (most runs) - Anton De Beer - a great season for the star batsmen, touching the 1k mark with 1018 runs. Batting trophy (averages) - Anton De Beer with an average of 84.83. Captain's trophy - Simon Pugh - in his debut, he scored 150 runs most notably from the opener's berth and took 4 catches from, donning the gloves, and providing his cricketing knowledge when most needed. Peter Bearman trophy (Most Improved Player) - Kieran Burke - the youngster proving his worth in the Sunday side with 11 wickets and 113 runs. Clubman's trophy - Anton De Beer - voted by his fellow club members for his coaching and all round on/off field participations. Stuart Burke returned to the statistical with his 2010 stats booklet. Club members were engrossed in their own performances as well as the gentle banter associated with success/failures this term! Martina and Tony from the Olde Red Lion must also be thanked for their contributions, providing the superb venue, food and atmosphere for the 3rd year running.